Shopping for Batman Car Accessories? While you're driving, be sure not to be driven mad by the Joker! 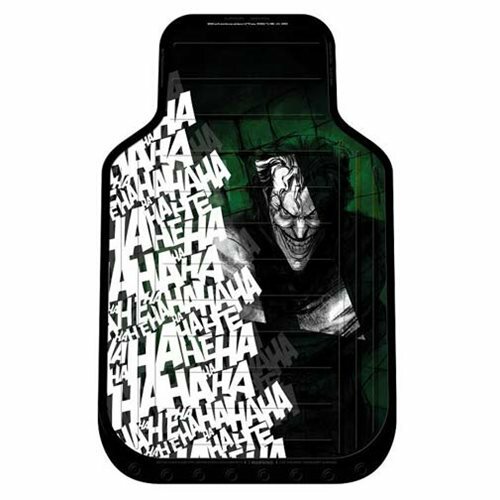 This Batman Joker Laughs Plasticlear Floor Mat 2-Pack features the Clown Prince of Crime looking as deranged as ever, next to his signature "Hahahaha" design. These floor mats are universal fit and ultra-durable. Sold as a pair, they measure about 27-inches long x 17 1/2-inches wide. Molded in vibrant colors, from the highest quality materials for long-lasting wear, will not fade and these are easily cleaned with soap and water. Includes 2 mats.